April’s second week is here with Weekly Predictions from AstroSage! Make the most of it by walking hand in hand with the future. This week would see you in high spirits. You’ll be on cloud 9, as you bounce through the week. A stubborn attitude with a sharp tongue is lethal for you; do not get hot under the collar due to petty issue. Your anger is potent to harm the people close to you. Well being of your mother and spouse might dwindle in this period. You must take extra care of them to maintain them in the pink of their health. Refrain from having clashes with anyone. You’ll be great at work and will enjoy every task assigned to you. Some natives might think of going abroad. For added gains, you’ll apply your tricky ideas, which will yield you benefits. LOVE PREDICTIONS: This week would be great for love affairs, although minor misunderstandings might become the cause of arguments. The start of the week would give you good results. You’ll get plenty of options for going out with your partner. The mid would be average, but the end would be on a brighter note. REMEDY: Meditate and worship Lord Vishnu by offering yellow flowers. This week you’ll have great income, so the gains would be high, but you’ll shell out more than usual. This would increase your expenses; luxuries and comforts will be your top priority in this duration. Health might remain down. Love matters will be positive and you’ll enjoy the romance in your relationship. You are advised to stay at par from ego clashes. After midweek, Your expenses would sky-rocket. At home, there won’t be peace and harmony, due to which you would like to spend time out with friends more. LOVE PREDICTIONS: This week would give you average results in love life. There are chances that due to too much work pressure, you won’t be able to find much time to enjoy the company of your lover. At the beginning of the week, abstain from any arguments. The mid of the week would be fun filled, and you’ll enjoy the time to its fullest. As the week ends things will settle down. REMEDY: Offer rice kheer to little girls and take their blessings. You would enjoy monetary benefits in this week. New opportunities would ring in at your door; make sure that you grab them by the neck. Your growth depends only on you and the choices that you make. Domestic life would be harmonious. You’ll garner authority at work. Love life would be average. You’ll be highly determined. Some journeys are probable in this duration. Minor issues might crop up in your love life. Health of your spouse might decline, so make sure that you both eat healthy and balanced diet. Wise decisions will give you good recognition this week. LOVE PREDICTIONS: This week might feel like a drab to you. However, if you are married, chances are that you’ll have a good relationship with your partner. The start of the week might see you in a bit of an emotional state. Although, as the week comes to a close, you’ll see things finally getting better, if they weren’t already. A plan to go out and enjoy won’t be much of a hassle for you. REMEDY: Offer spinach or green vegetables to Cows. This week you’ll be super helpful towards your siblings. An artistic hobby or a task would attract you. You’ll outshine your enemies and strive harder to perform better than anyone else at work. Some gains through short journeys are probable. Health might steep down, ut with added care you will be able to rectify it. Pilgrimage is likely. Some troubles in your married life might happen; keep your calm so that you don’t attract negativity. Give some time to your spouse to listen to them and understand the crux of the matter. LOVE PREDICTIONS: This week would give you amazing results in your life. Your relationship would be helpful in coping up with the stress at work. However, you’ll get less opportunities to see your lover this week. But, the mid of the week will be average. You are advised to keep your emotions in check and do not let them rule over your head. You’ll pay heed to what your partner says and abide by it. At the end of the week, some minor arguments are possible. REMEDY: Donate mustard oil in a mud pot after seeing your face in it on a Saturday. Your health is likely to improve in this period. Your glory would increase; as the name and fame follows suit. Luck will be on your side. You might consider going on a religious trip in this period. Siblings are likely to suffer this week; take care of their health. Your sensual approach would increase. Wealth gains are likely. Your relationship with your father might get affected, so keep a check on your tongue. LOVE PREDICTIONS: This week would give you mixed results in terms of love life.you are advised to keep your behaviour straightforward and to the point. The beginning of the week would be favorable. You’ll be passionate in your relationship. However, by the mid of the week, this is expected to manifold. Despite of this you’ll find it hard to meet your partner. Matters and conversations encircling love will sound soothing to your ears. REMEDY: Offer kumkum infused water to God Sun . You’ll have a good mindset in this period, and will make all the right decisions. Marital bliss would be there, but some minor issues will trouble you. This will be a time for you to look back and retrospect. Your expenses will be huge; work would keep a low status. You are advised to work hard in order to stay in the good books of everyone. Maintain your relationships with everyone and stay cordial. LOVE PREDICTIONS: The week would give you average results. You’ll be able to maintain a balance between your love life and vocation. The start of the week will be harmonious, with the mid following suit. You’ll be high spirited and will enjoy life to the fullest. The week is probable to end on a not so sweet note, so make sure that you get yourself prepared for that. Stay modest and calm. REMEDY: Serve cows as much as you can. Mind would remain disturbed with several issues. There could remain some issues in your marital life as well. Spouse might dominate over you for the duration of the week. You could indulge in some disputes, so keep a check on that as well. Fluctuating work conditions might keep you on your toes. You may be lethargic and that would be quite evident from your work. You would dominate over your opponents. Come the Mid of week, some tension with your spouse could witness an increase however, at work you would shine really bright. LOVE PREDICTIONS: This week would bring in auspiciousness in your life. But, quite a few times it is possible that the burden of tasks would keep you too preoccupied to focus on your love life. However, in case of being in love with a colleague, you’ll be blissfully in love. The mid of the week would enable you to balance between the two lives that you live, but the weekend sue would be the star for you! REMEDY: Gift perfume to your loved one. You are likely to be in high spirits this week. You would be in a mood to take on challenges. Domestic life would lack harmony. However, material gains would be there. You would really enjoy the company of your friends and loved ones. If you ignore ego clashes then your love life would flourish a great deal. Marital bliss would be there as well. 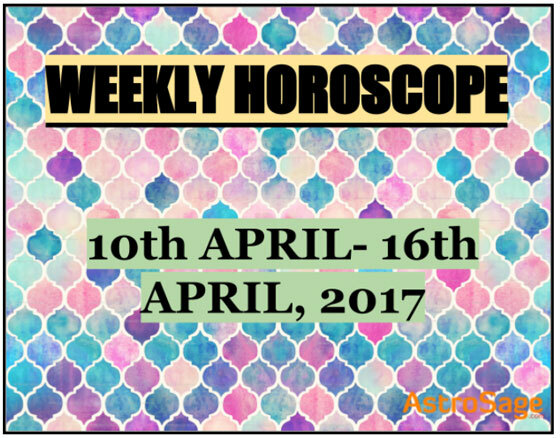 LOVE PREDICTIONS: The week looks auspicious enough to give you brilliant results. You are advised to keep your dignity and nobility intact. Otherwise, chances of defamation are high. In case you are in love with a colleague, chances are that you’ll have to face the wrath of your boss. The mid of the week would be a little slow, but as the week conspires to an end, you’ll see changes coming in. REMEDY: Apply saffron Tilak on your forehead. You are likely to experience good times at work. You should enjoy your work in order to be successful and more efficient. You will work really hard and thankfully it would pay you as well. Domestic life would flourish, but not before the mid week. Don’t become so demanding in love matter, just enjoy the breeze of love. Journeys might soon take place sooner than later. Avoid over stress to maintain and enjoy good health. LOVE PREDICTIONS: This week is good for love relationships. However, some minor issues at work will trouble you; love would act a balm to your woes. The week would start t a great note; the married masses would benefit in this duration. Keep your modesty intact. The weekend would bring lost prosperity back. REMEDY: Worship Lord Shiva and offer him wheat grains. Your health might witness a decline this week. You may experience harmony at home. Your Expenses would most likely increase. Any property deal that was long in the pipeline may now be finalized. Health of your mother might get affected. High determination will keep you on track this week. Short trips could soon be a possibility. Your father is likely to get lucrative benefits this week. You would have a charitable approach while a pilgrimage may soon be on the cards too. LOVE PREDICTIONS: This week promises to give you mixed results in terms of love related matters. However if you’re in love with someone who lives far off, the results will be more favorable. The start of the week will be great; if you keep matters light, things will stay in shape. Do not make a moutain out of a mole. Stay modest in your approach. REMEDY: Meditate and worship Lord Shiva by offering blue flowers. Although some mental stress would be there but it will be released come the middle of the week. Gains through spouse are likely as your spouse may get name & fame. Short trips are on the cards too. You really need to work hard, in order to maintain a balance in matters involving love. Marital relationship would be full of ups & downs but, you would be able to cope up with things. Your determination will be on an all time high. You could also experience gains through your own efforts as well as hobby. You could think about changing your workplace as well. LOVE PREDICTIONS: This week would be average for the naties of this zodiac. Keep your credibility intact. Do not by any chance let it drop. If you’re in a new love relationship, you are advised to maintain a good impression. The start of the week would be great; your love would increase. The mid of the week also seems favorable. However, the end of the week might be a drab for you. REMEDY: Do mopping of the passage of any religious place. This week will remain positive and progressive for you. You will experience a good mental state as well. Your decisions will turn out to be pretty wise. There will be harmony in marital life. You will do work hard at work and would reap its benefit too. But, you shouldn’t become a workaholic. Aggression would increase in your speech hence you are strictly advised to avoid arguments. You may receive good gains this term. Expenses would remain high which needs to be cut down as soon as you can. LOVE PREDICTIONS: In general the week would pan out to be more than reasonable for you. Although the start of the week might be problematic for your love life , but over all you would end up enjoying it. The middle of the week would provide you favourable results. You could propose someone that you had a crush on or you could harbour a crush at your tutions or school. There is a strong possibility that you could have a big argument with someone so refrain yourself from speaking ill about anyone and just try to avoid such situations as much as you can. REMEDY: Pour water in peepal tree roots on thursday and apply turmeric tilak everyday on forehead. We at AstroSage hope that the following information was pretty useful for you, as we really hope that the week pans out well for you and you come out enjoying the week like you had hoped for!